Error: "The server is not operational"
If you face an issue "The server is not operational" while executing Active directory queries or using tool which connect to Active Directory, you will need to check the connectivity with the active directory. If still issue persist you will need to check domain DNS entries. Check if forward and reverse look-up entries are populated correctly, for the active directory domain you are trying to connect. If above steps does not resolve the issue and if you programatically connecting to active directory then try to use cached connections for the different queries.
" while compiling C++ program using g++ in Ubuntu, then you might have used incorrect file extension for your code file. As File names are is case sensitive in Linux the file extension that you have specified for your program code file also matters while compiling the code. You should use ".CPP" (All in capital letters) or ".cpp" (All in small letters) extension to your code file. To check if you have gcc installed on your Ubuntu type gcc on the terminal. If terminal shows you following error means you don't have gcc installed. "gcc: fatal error: no input files"
You will have to install the add-on for the Firefox, there are DownThemAll, FlashGot and many more add-ons available for the purpose of download acceleration.Visit the webpage https://addons.mozilla.org/en-US/firefox Click on the Most popular list, or search for above mentioned add-ons or for any of the download accelerator add-on you know, and Click on "+ Add to Firefox" button. Firefox will download the add-on, Then select the add-on and press Install and you are done. 1. Download utorrent from http://www.utorrent.com/. Right click the downloaded file and click 'Extract Here'. 2. Open the extracted folder. 3. Right click the file with name 'utserver' and make it executable. 4. To make it executable right click on utserver -> properties -> permissions -> add check the check box of "Allow executing file as program". 5. Now execute the file 'utserver' by double clicking it. 6. utserver runs as background program so you will not see any user interface on execution. 7. Open your browser like firefox , chrome etc. leave password field blank and press ok. If you fail to see the ui of utorrent the reason could be you don't have a dependent lib that utserver required, check this post for resolving the error. You have downloaded the Utorrent and trying to use the utorrent using webui. But if the webui is not showing up, then you need to check if the "utserver" is running or not. "sudo ps -e | grep utserver"
to see if utserver running. If it fails to execute you may see the error on terminal. It might be case that you will be missing the dependent lib. Install the dependent lib and start utserver again. It should start successfully. You may get the error "Unable to load CorelDrw.dll. Error Code : 998" when you are trying to launch the Corel Draw. This problem appears when you have installed "searchqu" application on your system. You may not have intentionally installed this application, it may be part of some freeware getting installed. Go to Add/Remove programs in the control panel. In Add/Remove program list find the "searchqu" application and uninstall it. Try launching the Corel Draw now. This should resolve the problem. Update: If you don't have "searchqu" installed, check if you have "iliveid" installed, it also does the same. If iliveid is installed uninstall it. If you are not trying to apply the update from LG and if your LG Optimus 2X or T-Mobile G2X is freezes after this message for long long time then follow below steps in order to recover the mobile. - Remove the battery. Wait for some time and put battery back again. Now start the mobile with power button. Do not hold any other button. - Even this time as well if you see the same S/W upgrade message you will need to install the custom recovery tool on your mobile using NVFlash or OneClickRecoveryFlasher. Follow the link http://forum.xda-developers.com/showthread.php?t=1044326. - Else you can use the SmartFlash Tool for LGP990 and recover the mobile with LG stock ROM. Follow the link http://forum.xda-developers.com/showthread.php?t=1448803 for how to use SmartFlash tool. Note: You may loose your data by following above steps. This post is for those who are trying to flash ClockworkMod using NVFlash or OneClickRecoveryFlasher or manually using command prompt on LG Optimus 2X or T-Mobile G2X. In order to resolver the error the partition number must be correct. In case if your trying to flash the recovery in T-Mobile G2X use partition number as 5. In case if your trying to flash the recovery in LG Optimus 2X use partition number as 14. 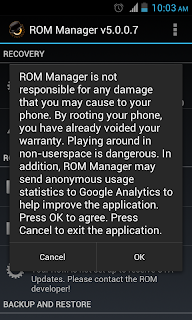 I WILL NOT BE HELD RESPONSIBLE FOR ANY DAMAGE CAUSED BEFORE, DURING, AND/OR AFTER INSTALLING CUSTOM ROM. PLEASE READ EVERYTHING, MAKE BACKUPS, AND FLASH AT YOUR OWN RISK. With the help of ROM Manager application you can easily upgrade your LG Optimus 2X (LGP 990) with ICS 4.0.4 custom ROM. For this you will have to first ROOT your device. To know how to root your LG Optimus 2X click here. Then install a free ROM Manager application available in Googly Play market. Now download the custom ROM that you want to install/apply. Copy the custom ROM to your internal memory of LG Optimus 2X (LGP 990), you can even copy the ROM to external SD card as well. Now follow below mentioned steps to apply the custom ROM.